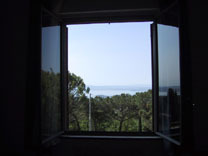 We drove west from Siena to Tuoro, on the north shore of Lake Trasimeno, a town and hotel recommended by Andy. 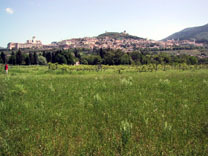 Tuoro was the scene of a great battle in which Hannibal defeated the Romans. The battle was so bloody that the surrounding towns were given names like Sanguinetto (bloody), and another Colli di Ossi (hill of bones). We drove up a mountain road to La Cima, a hotel with a magnificent view of the lake, clean air, quiet, a wonderful restaurant, a swimming pool, and lovely owners. All this for $55/night, including breakfast and a La Cima baseball hat. 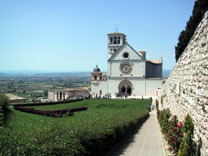 We drove on toward Assisi, stopping in Santa Maria dei Angeli, where the priest was blessing the newly communed children. .. Pieta, Padre! No lingua!! walking the length of the town to the Basilica of San Francisco. 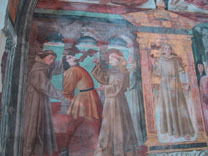 Inside were frescos of the life of St. Martin. Don't ask me why. We bought a small Franciscan monk, sitting at a computer, for Brother John McHale. We had lunch at a Trattoria and filled up with gas ($42.00). We drove through Spello, an ancient Roman town, and, half-sloshed on half a liter of wine, we lurched into Bevagna, another ancient Roman town, looking for some ancient bathhouse mosaic floor. 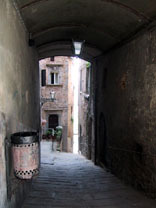 Bevagna turned out to be the hidden gem of our trip. 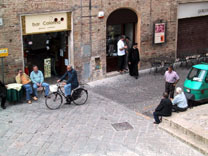 A tiny town of perhaps 500 people, it was empty on a Sunday--just the men sitting in chairs in the street, gossiping. We were the only tourists of any nationality in town. 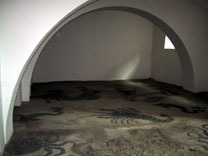 We found the bathhouse, which indeed had a mosaic tile floor, rather like Beit Alpha in Israel, with designs of lobsters, shrimp, and other sea creatures. 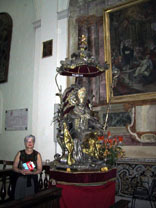 We entered an old Romanesque church and marvelled at a huge statue hammered of silver and gold. 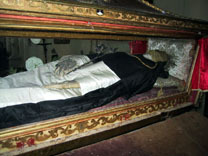 In the altar was a glass case, in which was the body of a man in a bishop's outfit, just the way Mother Cabrini lies in Washington Heights. He was pretty old--his hands had been replaced with wood carved hands, but his head remained, looking like a disintegrating King Tut. When we left the church, we asked a group of old men in the street who the man was. 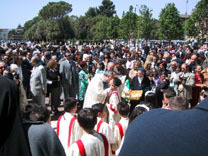 "Sta San Giacomo!" exclaimed one of them, rising to his feet on two crutches. He insisted on taking us into the church, assuring us that this was indeed the real and true St. James, and explaining that the statue was of San Vincenzo. 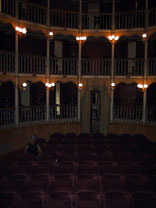 Then he insisted that we see the "teatro." 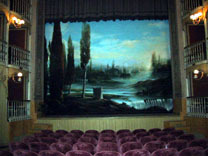 We thought that in a town of this size, the "teatro" might be something like Cinema Paradiso from the movie. But no, it was true opera house and theatre, middle 19th Century, very small in area, but several tiers high in a horseshoe shape, with red velvet seats and ornate gold carvings, and a wonderful hand-painted curtain. I took the stage to sing the Prologue from Pagliacci to an audience of one. Earlier that day, we had missed a real concert of Wagner's Wesendonck Lieder. How moving it was to discover such a hidden treasure of a little town, with buildings and monuments so old, with its own preserved saint, and an opera house to die for. Next, we came to Montefalco, a Fifteenth Century mountain fortress town, known as the "balcony of Umbria" because of its majestic views of the surrounding countryside, and renowned for its great red wine. We visited the Church of San Francesco, with a beautifully designed museum containing stunning frescos. 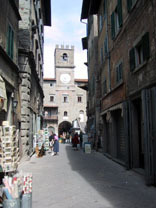 Next came Deruta, another ancient hilltop town, this one renowned for its ornate majolica (maioliche)pottery. We bought a few pieces for ourselves and for gifts. We returned to La Cima for dinner. The owner, who serves as the sole waiter for a lovely, quiet indoor and outdoor dining room, reminded us of Artie, the restauranteur in The Sopranos. Balding, with a moustache, cheerful, he hums as he bustles through the restaurant, placing dishes and wines before you with a proud flourish. There was beautiful Italian china and crystal. We had a bottle of superb Sagrantino di Montefalco, Carol had her long-awaited fried fiori di zucca--fried zucchini flowers, which she dipped in a whipped flavored ricotta cheese with balsamic vinegar. They were superb. I had prosciutto con meloni, followed by mixed grill, which was delicious, but not as good as the Florentine Grille in Providence. Carol had a grilled perch from the nearby lake, along with another fish, which she could not immediately identify, but spit out too late after discovering that it was eel. She is now enshrined in a painting by Il Sodomo of the eternally damned. For dessert, some delicious strawberries with lemon, and great decaf espresso. This dinner for three course dinner for two with wine and espresso and tip cost $55.